Here at WeAllSew, we love any excuse to sew, and the holidays are no exception. Each Friday from now until the end of the year we’ll be sharing some of our favorite free sewing projects for the holidays – from decorations to deck the halls to quick gifts for loved ones. This week we’re sharing some of our favorite projects to deck out your home with holiday spirit! If you have a favorite home decorating for the holidays project that we didn’t highlight, please share it with us in a comment! What better way to count down the days than with a handmade fabric advent calendar? Each of these little fabric tags has a pocket to hold a different little holiday treasure to discover each day. 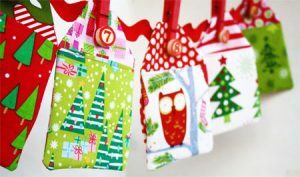 Visit Skip To My Lou to get the Fabric Gift Tag Advent Calendar tutorial. Festive fabric bunting can brighten up any space for the holidays – inside or out. In fact, you can change the color/theme of the fabric to match the holiday celebration – use blue and silver for a Hanukkah celebration; or use red, black, and green for a colorful Kwanzaa celebration. 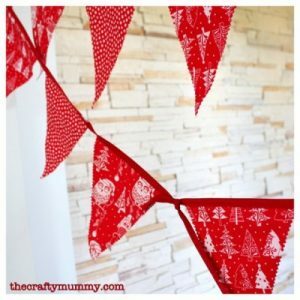 Click to get The Crafty Mummy’s Christmas Bunting Tutorial. Not only is this fabric ornament extremely festive, but you can stitch some up right out of your scrap bin! Use ornaments to trim the holiday tree or to hang in other spots around the house to add some holiday cheer. 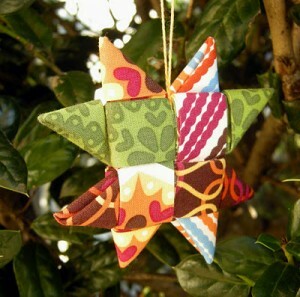 Get Betz White’s completely cute and clever Fabric Star Ornament tutorial. What could be more festive than a fabric wreath that reminds you of a yummy candy cane? 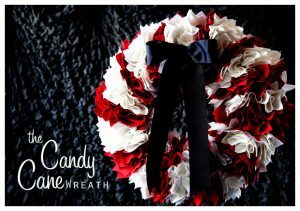 Or, use different colors of fabrics to get a comletely different looking wreath! Visit WhipperBerry to get the Candy Cane Wreath tutorial. Dress your Christmas tree in this pretty skirt and create the perfect place to set your holiday gifts. Go to the Cloud 9 Fabrics website to get the Christmas Tree Skirt pattern and tutorial.